The construction industry plays a crucial role in keeping the economy growing. Construction work is an exciting and rewarding career, but without proper training it can be dangerous. According to the Bureau of Labor Statistics, there were 5,190 workplace fatalities in 2016, Almost one in five of these were in the construction industry. That’s about 80 construction workers that die on the job each month. With the right training, however, many of these deaths and injuries can be avoided. Falls are one of the main causes of construction worker injuries and deaths. Employers are required to provide protection against falls whenever a worker is more than six feet off the ground. These can be guard rails, harnesses, restraining lanyards or safety nets. They need to be personally inspected before each use to be sure they’re not damaged and are working properly. Sawhorses or other barriers should be used around open holes or skylights to keep workers from falling in. Employers are required to certify that all workers have been trained to recognize and avoid fall hazards. CertifyMeOnline.net’s Fall Protection Training and Certification online course is a fast, affordable, and convenient way to meet the requirement. More than half of all construction workers use scaffolds on the job. This includes scissor lifts, which OSHA considers to be a type of scaffold. All tools and equipment should be attached to lanyards to keep them from falling and injuring people down below. Always remove all tools and equipment at the end of a shift. Never work on scaffolds when they’re covered in mud, water or ice, even if you’re wearing non-skid boots. Don’t try to extend your reach by standing on ladders or boxes. Always be sure scaffolds are on solid footing and are at least 10 feet from power lines. These include truck-mounted boom cranes, aerial ladders, and cherry pickers. Risks include falls, tip-overs, and electrical shock. Other hazards are collisions with overhead objects and being struck by items that fall from aerial work platforms. When working from a lift, a restraining lanyard or harness should always be worn. Lifts should always stay at least 10 feet from overhead power lines. Never exceed a lift’s reach or load limits. Employers are required to make sure all operators receive proper training, such as CMO’s online aerial lift training classes. For more information, here’s a blog post that has more tips on how to safely operate aerial lifts. All ladders need to conform to OSHA standards. Before climbing a ladder, be sure it’s properly secured. While climbing up or down, always have both feet and at least one hand on the ladder. Tie ladders to secure points at both the top and bottom to avoid sliding. Never carry tools up or down by hand – use a tool belt or haul them up with a rope when you reach the top and lower them the same way. When ladders are used with or around electrical equipment, they should have side rails made from materials that don’t conduct electricity. Always carry ladders horizontally to avoid contact with overhead objects. OSHA requires workers to use snug-fitting face masks and eye protection when they’re working with or around chemicals, acids, caustic liquids, or dangerous vapors or gasses. Known as personal protective equipment (PPE), they’re also required when chipping, grinding, welding, drilling or carrying out other tasks that produce flying particles. Before using them, always check eye and face protection equipment for cracks, chips or other defects – if any are found, dispose of them. Employers are required to provide their workers with these PPEs free of charge. Hard hats should always be worn on construction sites. They help prevent being injured by blows to the head from falling or flying objects or being struck by swaying equipment. Hard hats can also prevent electrical shocks if a worker accidentally bumps into an overhead line. As with all PPE, hard hats should be inspected for dents, cracks or other signs of wear and tear. Replace them right away if they’ve been exposed to an electric shock or heavy blow. 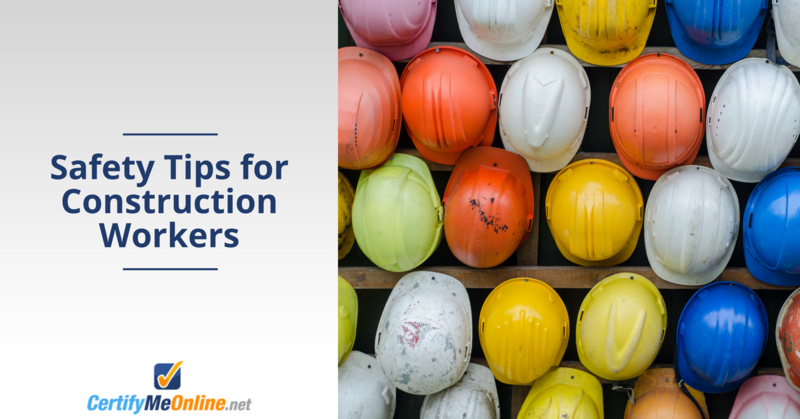 Just like eye and face protection and other PPE, employers must provide their workers with hard hats at no cost. Lead, asbestos, silica and chemically treated wood are just a few of the many harmful substances often found on construction sites. Other chemicals that are sometimes present include zinc, mercury, and cadmium. Employers need to provide Material Safety Data Sheets (MSDS) for these and all other hazardous materials on site. Workers need to read and fully understand them. They also need to be trained on how to safely handle and work with these materials, including wearing PPE. When handling toxic or hazardous materials, protective clothing should be worn. All hazardous material containers must be clearly marked with warning labels. All spills should be contained and cleaned up immediately. Workplace safety should always be first and foremost in the minds of every employer and worker. Employers are required to implement workplace safety programs to help prevent accidental injuries to their employees. Workers need to be able to recognize and avoid potential hazards. This entry was posted in Aerial Lift Certification on August 7, 2018 by admin.